Jason Allan Scott is a successful Serial Entrepreneur, Professional Keynote Speaker, Best Selling Author, Award-winning Event Professional, Mentor, Podcaster and a part of Tim Ferris's NR set who travels the world consulting, educating and empowering people. He has launched and established multiple business on 3 continents, including an event company, a non-invasive aesthetic medicine technology and franchise business, Lokkima, as a gift for for his Father. Scott has worked hard to create opportunities for others to better themselves through his talks, understanding of technology and his health and wellness intitive Calisthetics Games. 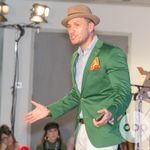 Scott is a widely recognised in the event world and has received multiple accolades for his work, he currently sits as Vice President of Strategy for Asemblr and is a judge for Small Business UK and The Association of MBA's Entreprenerial Award for the third year running.